"Kim, Jackie fought hard for a long time. 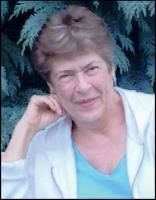 She kept her..."
Jacqueline “Jackie” Annette Strobeck of Vancouver, WA passed away on October 4, 2018 after a valiant two year battle with acute myeloid leukemia. She was 82. Jackie was born on February 14, 1936 in Kelso, WA to parents Francis LaPlant and Lorraine LaPlant (King). She graduated from Kelso High School in 1954. She was a secretary for Union Carbide and also a Mary Kay consultant. Jackie loved all things crafts, being with family and friends, gardening, cooking/baking, and shopping especially for a bargain. Jackie is survived by her son, Kim Strobeck (Terri); daughter, Julie Strobeck; and grandchildren, David Griffin III, Chris Goodall, Rachel McClain and Kathryn McClain. She was preceded in death by son, Kirk Strobeck; and former husband, Francis LeRoy Strobeck. A Memorial Service will be held for Jacqueline on Saturday, October 20, 2018 at 2p.m. at the Vancouver Church, 3300 NE 78th Street, Vancouver, WA 98665.